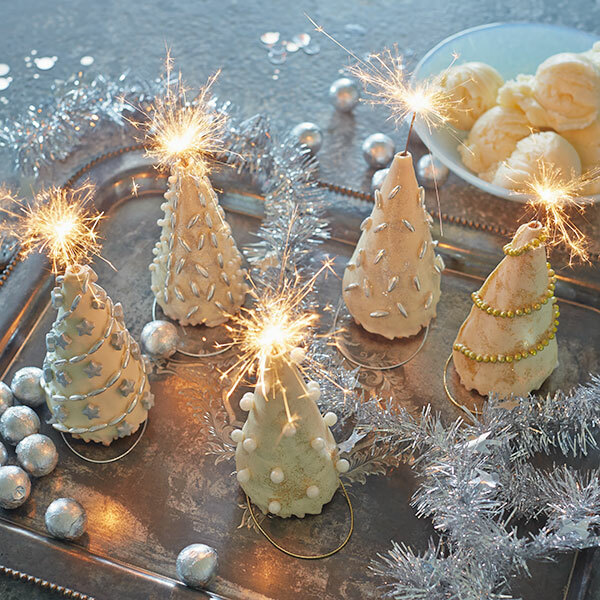 These white chocolate-dipped cones provide a festive flair to any New Year's Eve party. Our Sweet Party Hats are easy little treats that the kids can help make. To up the excitement and panache, top them with sparkler candles. Then, make a wish for a wonderful new year! Melt white chocolate chips or candy melts in a double boiler or a mixing bowl over a pot of boiling water. Pour into a container deep enough for dipping an entire cone. Using tongs, lower cone into the melted mixture top first. Allow excess to drip off. Place cone carefully on a baking sheet covered with parchment or waxed paper. While the chocolate is drying, apply candies, pressing lightly to adhere. Allow to dry fully before topping with sparkler candles or other decorative toppers.